PWC Forum: The best hang-out for Personal WaterCraft enthusiasts > PWC General Discussion > General PWC & Jetski Discussion > Truck Bed Boat Launch? New member here looking for some ideas about how to load and launch from my truck bed. Ive seen pictures of PVC set ups that seem to work well. I have a winch in the truck bed to pull the ski up so I have the power already but am lacking ideas on how to slide it out/in. Any suggestions? where I really need the help is the connection from the tailgate to the water. Any advice would be great. Thanks so much. 1) Where are the winch controls? I wouldn't want to control it from the cab without anybody watching the ski up close in the back. 2) How would you secure the rear of the ski. On my trailer I use 2 straps on the rear of the ski and tie down to the trailer under the ski. The straps "criss cross" to disallow lateral movement at well. Do you have the ability of tying down the ski like this on the Ranger? The key to this job, like anything else, is to avoid being the next YouTube sensation. 1) I have a wireless controller for the winch so I can be anywhere when controlling it. There is also another controller bolted inside the tool box if id rather use that. 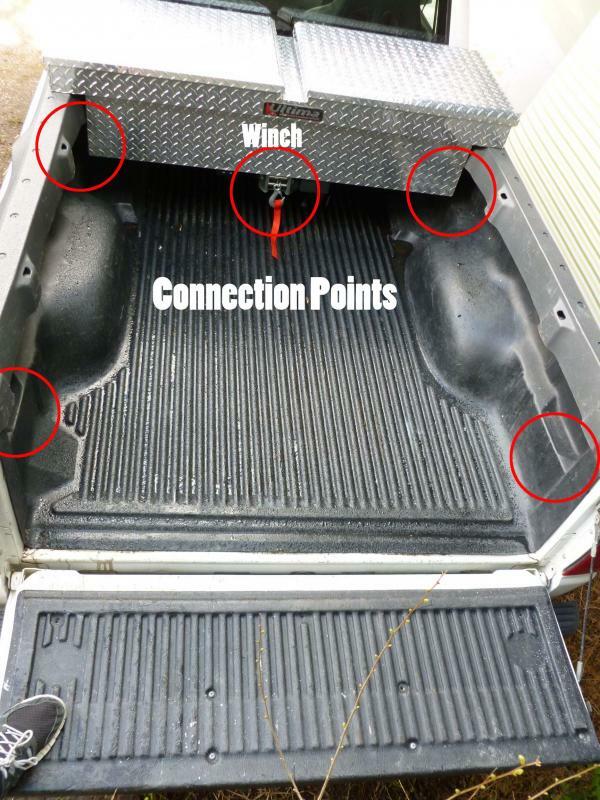 2) On my ranger I have cleats in each corner of the truck bed so I can still crisscross tie downs for safety still. That along with the winch that has an automatic lock there will be 5 connection points holding down the ski just like on a trailer. Its a long bed ranger but even with that the ski still sticks out the end a little bit. Ive had it in there a few times before without any problems. From tip to tail my skis hull is 10.8 feet long. Ill take a picture of the truck bed and attach it. Maybe that will help? Problem that I have seen from the system above, and from other custom made truck bed launch systems is the angle at which the systems put and pull the ski from the water. It all depends on the steepness of the ramp and the depth of the water, but you can easily damage the rear of the ski as it scrapes on the ramp loading and unloading if you are pulling the ski up at a steep angle. I think a system with an extendable ramp that keeps the angle lower when pulling the ski into the trailer would work best, but I haven't seen a commercial one like that. I saw that but the price was too high. At 2500$ id just buy another trailer. That angle is hard to make without damaging things. I know that PVC will work just fine for the bed. I see ski stands all the time people have made from them. I guess I just need to figure out the pivot point where the bed meets the ramp going into the water. If anyone has an idea about how to do that please let me know. I would use a dump bed but that is pricy. 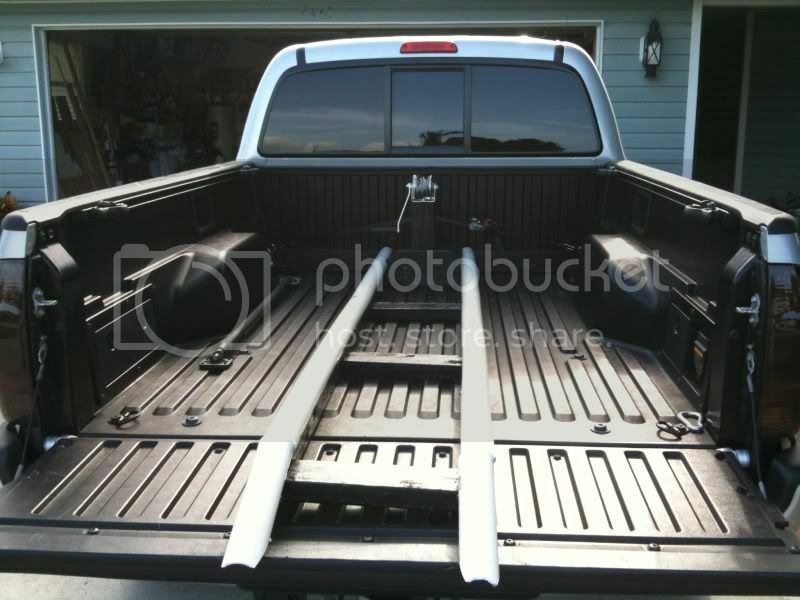 You can implement this idea cheaper by having a telescoping track (like a "ladder extension plank" (Google it)) that is hinged like a seesaw at the tailgate. Use the tailgate as the hinge by bolting the track to the gate and releasing the gate straps. The winch is mounted to the forward end of the track which is raised with a lifting jack. The boat is secured to a cradle that rolls up and down the track via the winch. First you back into position, extend the track so that it sticks out 8 feet past the end of the truck, jack the front of the track up, the seesaw creates a single angled track, the winch lowers the cradle down the track and the boat is deposited in the water, release the boat from the cradle and you are good to go. You will also need a way to secure the front end of the track to the truck bed when the boat is brought back up and lowered into the bed. Can I ask why? The device you are trying to build seems so complcated, and so prone to errors that could damage your ski, so why go that route? Even if you have another trailer you want to pull, it would seem simpler and safer to fabricate and pull tandem trailers than to fabricate the proposed truck-bed-mount. Here in OH it's OK to pull two trailers, if the whole assembly isn't more than 65 feet long. I do it all the time. That got me started on the right track. Thanks for the advice. I have an idea about how to do this now. Its really not that complicated. It basically a ramp that disconnects in the center. Difference between what i’m building and those on the market is that is has to be portable. There are many boat houses that have ramps using PVC and wheels on my lake. Those that work without damaging their skis. I don't see how this will cause damage by changing the destination from a boat house to a truck bed. Its a small and light weight ski that I can transport in my truck anyways and with another person can load in the water by hand. I just want to be able to launch it by myself and don’t have the money to pay for a new or used trailer. The winch has power in and power out so I can pull it up slowly and let it out slowly. It should be okay from everything i’ve seen. I have an idea about how i’m going to do it now. Thanks for the help. Please post pics when you are done.